In Depression-era Paris, a former bank teller (Charlie Chaplin) with an invalid wife (Mady Corell) and young son (Allison Roddan) has a dark record of secretly marrying and murdering wealthy women. While plotting to kill one of them (Martha Raye), Chaplin intends to test his poison on a down-and-out young girl (Marilyn Nash) but takes pity on her instead. 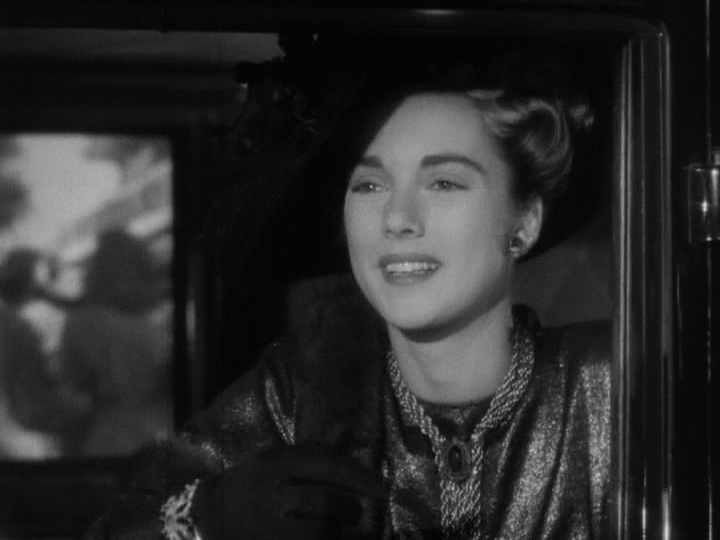 Meanwhile, he relentlessly courts a widow (Isobel Elsom) by sending her bouquets through a flower girl (Barbara Slater), and risks imminent discovery by the police. In Alternate Oscars, Peary names this the Best Film of the Year and once again awards Chaplin the Best Actor award (for the third time! ), thus providing plenty of additional written analysis. Peary’s selection of Monsieur Verdoux as the “best film” in a year filled with so many other worthy contenders — including the Peary-nominated Black Narcissus, Great Expectations, Miracle on 34th Street, Nightmare Alley, and Out of the Past — speaks volumes about his adoration for Chaplin’s oeuvre (and for underdog films that were unfairly maligned due to their creator’s politics). 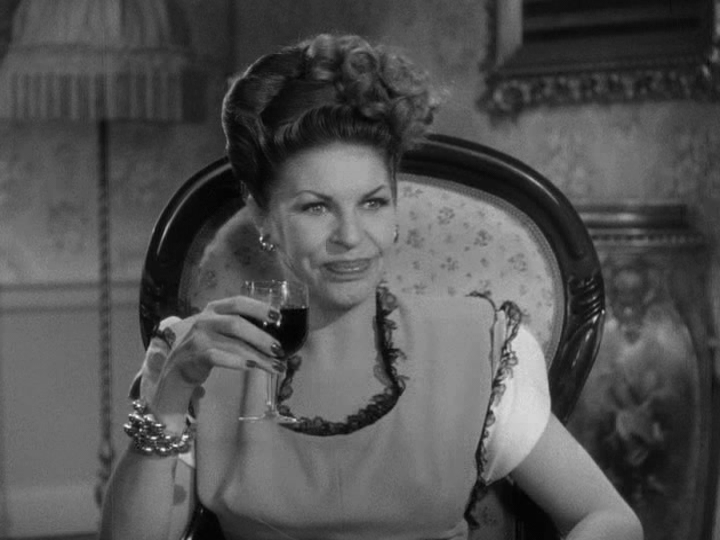 He writes that, “Depite its morbid plot line”, this film is “full of wit, ranging from Verdoux’s sardonic lines to wild Chaplinesque slapstick”. 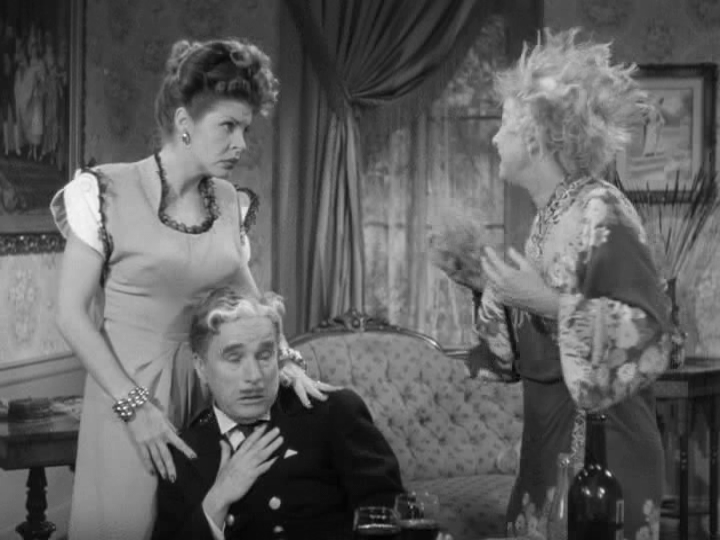 Peary adds that “Verdoux’s scenes with Martha Raye’s loudmouthed, nasty Annabella are some of the funniest in all of Chaplin’s work”, with “the sequence in which he tries to poison her… [a] most complex comedy routine”, and “Verdoux’s discovery of Annabella at his wedding to Madame Grosnay” [Elsom] “hilariously complicated.” He writes that “in addition to the humor, the picture has charm… poignancy… and tenderness”, yet “we never forget that the Chaplin who wrote and directed this film is quite cynical, quite serious”: while “no one would think that Charlie Chaplin could give us the creeps… that’s our reaction just before he kills Lydia [Margaret Hoffman]”. Verdoux is presented as a “wise but insane man”, and “viewers must decide for themselves where Verdoux is bound” (heaven or hell), given that he isn’t “so sympathetic or likable that we automatically forgive his crimes”. Yes, as a dark classic by a master director. Discussed at length in Peary’s Cult Movies 3 book. The Criterion DVD has two valuable extras. One is a lively and insightful conversation with director Claude Chabrol (who directed 1963’s ‘Bluebeard’ – his own version of the Verdoux / Landru story, which I haven’t seen). 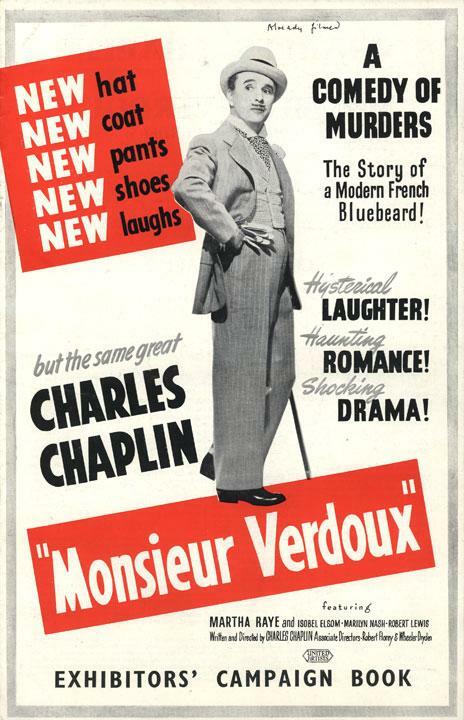 The other features some Chaplin experts who place ‘Monsieur Verdoux’ in context with Chaplin’s work in general and offer very informative specifics re: what was going on in Chaplin’s life at the time of filming and how he had fallen out-of-favor with American audiences (largely due to his politics and some of his associations). What I admire most about this film is Its (and Chaplin’s) audacity, in making this kind of reversal – or re-invention, if you prefer. Of course, everything he had done prior informed this film. But the exploration of new territory in material seems to have allowed Chaplin a kind of necessary distance and objectivity. I sense a bold sort of freedom in this film – a filmmaker untethered from the ‘tried-and-true’ that went on for quite a long time. I wouldn’t say this is a hilarious film, exactly. When I think of a hilarious film about murder, I think of something like ‘Eating Raoul’ – because its darkness goes a lot further. But I would say that it does stay firmly and appropriately within the confines of the Chaplin spirit – and is, therefore, whimsical. Consistently so. It’s a comedy of manners as well as of murder. And that, as it turns out, is a rather admirable thing. I would disagree with Peary re: one point when Chaplin and Raye are in the boat. Peary writes: “When [Raye] suspects something is fishy, [Chaplin] quickly sits down, legs crossed, with the hilariously innocent expression of a naughty five-year-old.” While Chaplin’s reaction is accurate, it’s important to note that Raye never suspects *anything* wrong at any time. Her turns toward Chaplin are merely a matter of comic timing. Note what she says to Chaplin when they are suddenly spied by a group of yoddlers. 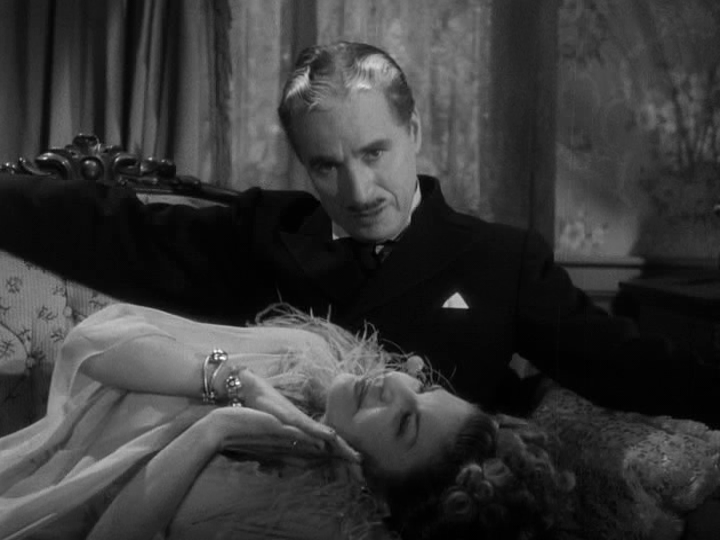 Chaplin has put a noose around her neck at that point – and she advises him to take it off, in case the group gets the (‘wrongful’) impression that he’s trying to kill her (!). ~which brings me to pointing out that, as acting partners, Chaplin and Raye reveal impeccable timing together in all of their scenes. ‘MV’ is a film that would hold up well for repeat viewings. It’s rich, complex and rewarding-enough to re-explore for a number of reasons – not the least of which is the depth (and unlikely deadliness) of the protagonist. 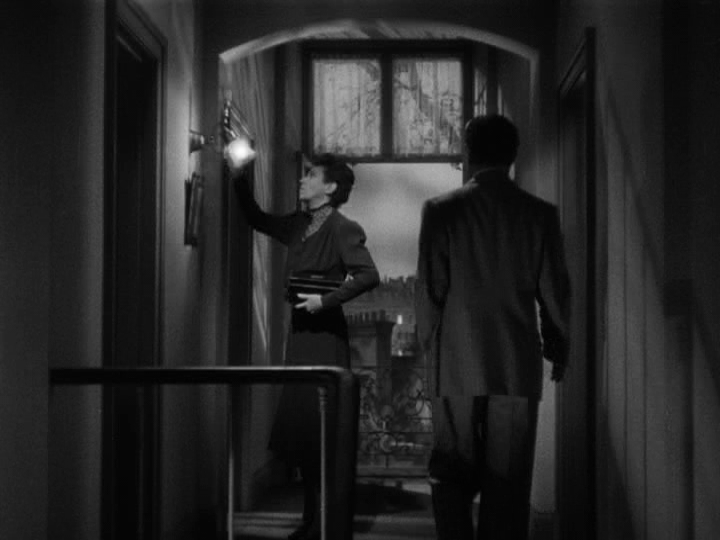 Favorite sequence: though the film has a number of scenes of particular power, a standout for me is the entire section involving the film’s only actual murder.